House of Payne: should it have ended? Tyler Perry’s House of Payne: Should the TV Series End? After 254 episodes and eight seasons, this evening marks the end of Tyler Perry’s House of Payne TV series on TBS. 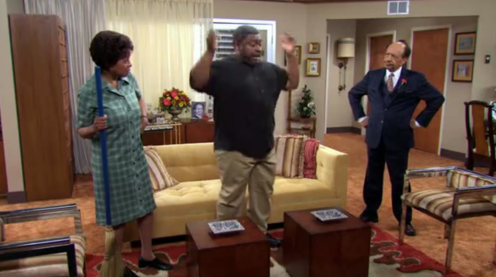 In April 2011, the cable channel announced that they were ending the venerable sitcom, in part to make way for Tyler Perry’s For Better or Worse. At that time, we understood the final episode total for House of Payne to be 220 installments. In late September 2011, Perry posted on his Facebook page that TBS had ordered even more episodes. In December, the cast and crew had a wrap party that celebrated the completion of 254 episodes. We now know that was the last. The series finale of House of Payne is called “All’s Well” and it caps off a very successful run. In fact, it’s the longest-running sitcom with a predominently African-American cast — surpassing The Cosby Show (201 episodes), Family Matters (215 installments), and The Jeffersons (253 episodes). Still, it can be hard to say goodbye, even after a very long run. What do you think? Are you sorry to see House of Payne go? Should TBS have ended it? What will you miss? More about: Tyler Perry's House of Payne, Tyler Perry's House of Payne: canceled or renewed? Best sitcom ever. LaVan Davis is a great leading man. I wish there were more scenes with Curtis and Calvin. I REALLY LOVE TO WATCH HOUSE OF PAYNE AND IT DOESN’T NEED TO GO OFF THE AIR! YOU AN’T FIND TV SERIES MORE REAL THAN THIS!!!!! My question I don’t know if anybody remembers this but Bill Cosby had a crossover show called his family show called A Different World Maybe Tyler Perry should do that with the son Malik ,Like what happened to his friend Kevin, and the guy from New York or what his one time wife did he still get back to her after their annualment.Or what about the sister Jazmine what she do when she graduated the prep school and the twins how they do when they got older.